Hundreds Dead In Haiti. People Fear Cholera Will Spread To Camps. 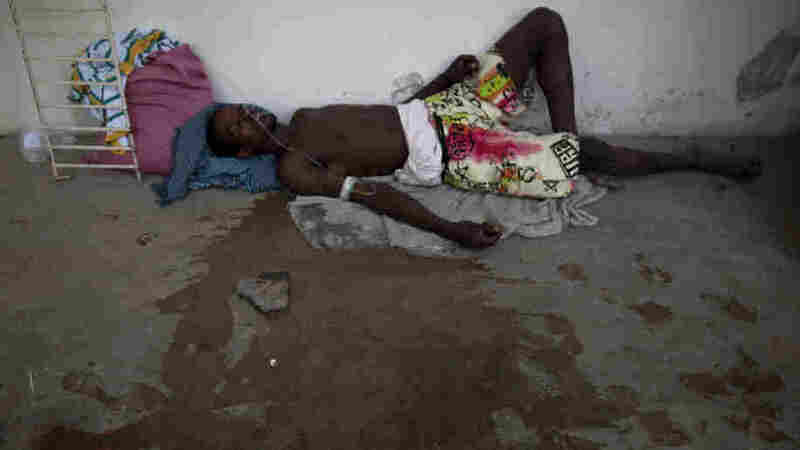 : The Two-Way The cholera outbreak in Haiti is only going to get worse. NPR spoke with Jacqueline Charles of the Miami Herald and she says people in the capital are terrified as they wait for the disease to reach Port-Au-Prince. At this point it seems inevitable. People in Port-au-Prince are waiting. Waiting for cholera to come. Reports from the ground in Haiti are saying it is not a matter of if, it is a matter of when the disease spreads to the capital. NPR spoke with Jacqueline Charles this morning. She's there reporting on the outbreak for the Miami Herald. And what she said was chilling. We are basically bracing ourselves for something we know is coming. And, unfortunately, I think in Haiti right now it’s not even a question of how many people will die, as it is a question of how many lives can be saved. For now, only five people in Port-Au-Prince have been diagnosed with the disease, and they've been quarantined. They contracted it in the rural area where it first broke out. At the moment, about 250 people are dead. Many, many more are sick. Hospitals in the area first hit by the disease are overflowing with people. They are filling up hallways and spilling out into courtyards and parking lots. Charles describes a fear of water that has descended on the country. Cholera is water born, and people are now afraid to drink it, even if they know it is safe. Charles calls it a vicious cycle, as it's what you need to live. Cholera causes dehydration and diarrhea that can kill within hours. The image of a cholera outbreak in the capital is terrifying. More than a million people are still living in ramshackle camps. There is little safe water in Haiti, says Charles, it was an issue before the earthquake, and only worse now.